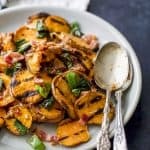 Grilled Sweet Potato Salad with bacon and a tangy honey mustard dressing. The perfect healthy and delicious side dish this summer! To a large bowl add sliced sweet potatoes and drizzle with canola oil. Toss to coat. Place sweet potato slices directly on the grill and grill each side for 4 minutes. While the sweet potatoes are cooking, place green onions directly on the grill. Grill each side for 2-3 minutes, until slightly charred. Remove from grill and roughly chop. Once the sweet potatoes are charred and cooked through, remove those from grill and place in a large bowl. To that same large bowl add charred green onions and bacon. Set aside. Right before serving, to a small bowl add minced garlic clove, whole grain mustard, dijon mustard, honey, lemon juice, apple cider vinegar, olive oil, salt and pepper. Whisk to combine everything. Drizzle the dressing over the sweet potatoes and gently toss to coat all the potatoes. Serve.